2003 saw the return of the Mach-1 special model Mustang. A quantity of 9,652 Mach-1 Mustang coupes were produced in 2003. It had a special 4.6L engine which used heads from the SVT and a DOHC cam from Ford's 5.4L Triton V8. This boosted horsepower from the stock 4.6L V8 in the GT from 260hp to 305hp and torque from 302ft-lb to 320ft-lb. The Mach-1 also had a distinct stripe and trim package. Azure Blue was exclusive exclusive exterior color for the 2003 Mach 1 although it also came in Oxford White, Zinc Yellow, Dark Shadow Gray, Black, and Torch Red. Azure Blue 2003 Mach 1 Mustang coupe with the stock 305hp 4.6L Dual Overhead Cam V8 engine with shaker hood scoop. 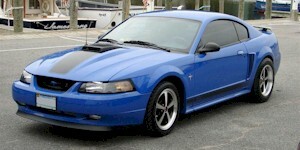 The Azure Blue paint is only available on the Mach 1 in 2003. Check out this Black 2003 Mach-1 Mustang coupe owned by Jared from Hamilton, New Jersey. It has a black interior and a flat black stripe on the hood. For a powertrain, it has the 4.6 liter DOHC V8 connected to a manual transmission. Azure Blue 2003 Mach-1 Mustang coupe owned by Peter Vander Sluis from Syracuse, New York. It has a 4.6L V8 engine and a 5-speed manual transmission. Peter tells us more, "I bought this Mach 1 about a year ago from a guy in South Carolina. It has real Saleen wheels and a Cobra bumper. The exhaust system is the stainless steele 'Borla' with 4-inch chrome tips, and it sounds dynomite! " Azure Blue 2003 Mustang Mach 1 coupe with an aftermarket Procharger 322 all Aluminum modular engine, functional hood scoop, and sport wheels. The tires are 17" x 8" BFG G-Force 245/45R17 in the front and 17" x 10.5" BFG 275/45R17 in the rear. Handling modifications include: D&D performance T-56 transmission, 6-speed pro 50 shifter, 26T input shaft 30T viper output shaft, vented rotors, 96 lb injectors with driver Kenne bell boost, a spark AJE 2'' drop spindle, K-member A-arms and coil over struts, flaming river rack and pinion, Aeromotive eliminator pump with bypass return regulator and fuel rails, Aeromotive fuel pump controller, Auto meter gauges fuel/water/oil/boost and AEM air-fuel-ratio (afr) gauge, sump stock fuel tank, and 2" box sub frame connectors. Black 2003 Mustang Mach 1 coupe owned by Daniel J from Comfort, Texas. This is our featured Attitude Of The Week for the week starting May 19, 2013. It has the 4.6L V8 DOHC 305hp V8 engine and a manual transmission. It also has JBA stainless exhaust, C&L cold air intake, and lowered 18-inch rims staggered. Hero card for the 2003 Mustang Mach 1. The specifications are on the back side. They are listed as Shaker Hood Scoop, 4.6L 4-valve dual-overhead-cam V8, Mach 1 wheels modeled after the Magnum 500, chrome tip exhaust, leather trimmed interior, retro-look instrument cluster, aluminum shifter ball, and low-gloss black spoiler.